From the creators of Madagascar and Kung Fu Panda comes a hilarious "fun-fueled family adventure" (Bill Bregoli, CBS Radio News) that proves no dream is too big ... and no dreamer too small. When an ordinary snail named Turbo acquires the power of super-speed, his life kicks into overdrive! With the help of a struggling taco stand owner and a streetwise snail crew, Turbo will attempt to race in the Indy 500 and make all their dreams come true. $21.312 million on 3806 screens. Usually family-oriented movies become a license to print money, but it appears that studios pushed their luck too far in 2013. 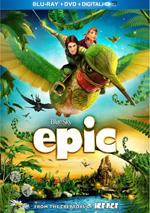 Over Memorial Day weekend, Epic launched the summer animation season without much of a bang, as the big-budget adventure topped out at a tepid $105 million in the US. Matters improved a few weeks later with Monsters University - a pretty decent hit – and the good times continued to roll with the even more successful Despicable Me 2. I’d like to say it’s a neglected gem, but instead, Turbo becomes pretty forgettable fare. 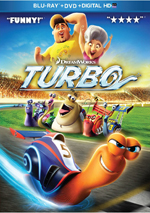 Ordinary garden snail Theo (voiced by Ryan Reynolds) obsesses over the desire to go fast – and refers to himself as “Turbo” as part of his fantasy. His levelheaded brother Chet (Paul Giamatti) constantly attempts to bring Turbo back down to earth, but the speed-obsessed critter’s dreams remain. Turbo’s ambitions get a literal boost when he falls into a souped-up street racer’s engine and swallows a big gulp of nitrous oxide. This turns his fantasies into reality as Turbo can now race at hundreds of miles per hour. After a mishap in the garden where they work, Turbo and Chet get fired – and find themselves trapped by taco vendor Tito (Michael Peña). Why does Tito capture the snails? Because he and his cohorts at a failing LA strip mall race the mollusks after hours. Turbo meets fellow snail Whiplash (Samuel L. Jackson) and the other racers before he blows them off the course with his insane speed. This launches a dream into motion. Inspired by his idol Guy Gagne (Bill Hader), Turbo wants to race in the Indy 500, and despite the reality check provided by his brother/business partner Angelo (Luis Guzmán), Tito works to make this happen. We follow their attempts to do the impossible. Although I gently mocked my then-GF, I kind of understood her point. We can all suspend plenty of disbelief at the movies, but we also have our limits. Some fantastic notions work and others don’t. Chalk up much of Turbo in the “doesn’t work” category. For fantasies to succeed, they need to create a sense of verisimilitude and logic that work within their own little universes, but Turbo doesn’t achieve this. There’s just something off about the movie from the start. How does the snail run a VCR? Why does the garage owner leave these racing tapes available? Why don’t humans ever seem to harvest their garden’s tomatoes – or try to eliminate the snails that overrun them? Call this nit picking if you’d like – and you’d probably be right – but these odd leaps of logic make it more difficult for me to suspend disbelief. When the tale throws us off from Minute One, it becomes tougher to let go and dig into its events. I suspect the absence of internal logic bother me less if I found the movie more entertaining. When I saw Turbo theatrically, I actually looked forward to it. Based on the trailers, I thought it would be witty and clever. Alas, as often becomes the case, the ads contained the majority of the movie’s funny lines. Not that it lacks anything else to entertain, but the fun pops up less often than I’d hoped and expected. Which leaves us with a fairly slow, fairly predictable tale. Scratch that - Turbo delivers a completely predictable tale, as it follows shopworn “believe in yourself/follow your dream” elements that seemed tired back when Walt Disney roamed the earth. Not that I really object to a well-worn theme in a movie like this. I understand that they don’t make animated flicks such as Turbo with the middle-aged male audience in mind; while studios clearly hope to snag adult dollars, the kiddies remain their target, and those youngsters won’t know that they’re watching a story that’s been done to death. Although I can live with a predictable narrative, I find myself less pleased with the lackluster execution found in Turbo. The movie fails to bring much life to the screen, as all the characters and situations feel bland and rehashed. Even with the smattering of funny moments heard in the trailers, there’s not much quality comedy across the film’s 96 minutes. That leaves Turbo as a watchable but bland adventure. It comes with a good cast, but they do little to elevate the material. Jackson probably fares best, as he engages in some knowing self-parody, and the others seem fine, but none of them delight. While I can’t call the cast a liability, I can’t refer to them as a strength, either. In truth, Turbo never does anything overtly wrong – it just never does much to rise above a level of mediocrity. The movie delivers mild entertainment and that’s about it. Turbo appears in an aspect ratio of approximately 2.35:1 on this Blu-Ray Disc. No issues arose here, as the movie always looked terrific. Virtually all shots looked crisp and concise, with no signs of softness on the horizon. We got a consistently tight, accurate presentation from start to finish. Jagged edges and moiré effects created no concerns, and I also witnessed no signs of edge enhancement. Print flaws remained absent in this clean presentation. Turbo featured an appealing palette, and the disc demonstrated positive color reproduction. It mixed a nice variety of hues, and these came across as well-rendered. Black levels seemed distinct and rich, while low-light shots came across as appropriately dense but lacked any issues related to excessive opacity. Everything here looked very good. Turbo’s DTS-HD MA 7.1 soundtrack was also a strong effort. Some smooth directional dialogue popped up at times, and the score demonstrated clear stereo imaging. Effects appeared in their appropriate places and moved cleanly across the spectrum. The surrounds added solid reinforcement of these elements throughout the film, and they kicked into gear well during louder sequences. The movie’s many driving sequences provided some nice discrete audio, with elements that seemed accurately located and dynamic. Audio quality was similarly positive. Speech seemed natural and distinct, and the lines showed no problems related to edginess or intelligibility. Music was lush and vivid, as the score appeared bright and dynamic throughout the film. Effects came across as accurate and concise, with very nice low-end response when appropriate. This became a vivid, involving mix. A smattering of minor extras fleshes out the desk. Champion’s Corner provides a five-minute piece in which TV host Paul Page chats with Indy 500 winner Turbo. It’s cute – and almost plays like a deleted scene - but it remains fairly pointless. With Smoove Move’s Music Maker, we see six segments with a total running time of 12 minutes, 47 seconds. A few turn movie scenes into music videos, while others simply reproduce song-related segments from the film. “Let the Bass Go” delivers an actual music video with Snoop Dogg, so it’s the most interesting of the bunch. Otherwise these become a pretty insubstantial addition to the set. Team Turbo: Tricked Out runs two minutes, 43 seconds and offers a closer look at the movie’s snails. We see the various accoutrements each little racer sports. Like its predecessors, “Tricked” is decent but nothing memorable. One Deleted Scene lasts two minutes, three seconds. A 31-second intro from director David Soren lets us know why the sequence got the boot, and then we see “Meet Tito”, the original introduction to that character. Presented via a story reel, it’s a fairly enjoyable clip; it might not have worked in the final movie, but it’s good to see. Next we get a Storyboard Sequence for “The Race”. With another intro from Soren, we find a two-minute, 25-second piece that compares the boards for “The Race” with the final footage. It becomes a nice presentation. Be An Artist! gives us a series of tutorials. 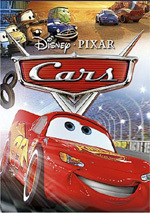 Accompanied by head of character animation David Burgess, this one-hour, 56-second compilation shows us how to draw “Turbo (Garden Shell)”, “Turbo (Racing Shell)”, “Burn”, “Smoove Move”, “Skidmark”, “:Whiplash”, “White Shadow” and “Chet”; the final segment enables you to “Customize Your Own Racer”. The segments move along pretty briskly and are fun to see; even if you don’t try to draw the characters, you’ll learn a fair amount about design choices and animation techniques. An interactive piece comes via Shell Creator. Here you choose your favorite snail and then select colors for body and shell as well as graphics, spoiler, engine, pipes, accessory and background. I can’t say this did a lot for me, but I suspect kids will enjoy it. The disc opens with ads for The Croods, Shrek: The Musical, DreamWorks Dragons: Defenders of Berk, and Turbo FAST. Sneak Peek adds promos for Walking with Dinosaurs. Epic, DreamWorks Dragons: Riders of Berk, Kung Fu Panda: Legends of Awesomeness and “Holiday Favorites”. 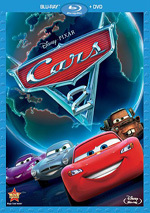 We also get the trailer for Turbo and various movie scenes under World of DreamWorks Animation. A second disc provides a DVD copy of Turbo. This includes “Sneak Peek” and “World of DreamWorks Animation” but lacks any of the other extras. With a goofy but fun premise, I hoped Turbo would give us a peppy animated adventure. Unfortunately, the result lacks much charm or creativity; it limps along as a mediocre tale. The Blu-ray comes with excellent picture and audio but lacks substantial bonus features. Turbo offers passable family fare but never reaches higher than that.